Due to the diversity of their function areas, airport buildings have to meet complex requirements for their air-conditioning technology. From the terminal building with large room height and often large glass facades to protected areas subject to special security guidelines or shops with bright and friendly yet heat-generating lighting concepts – in every case an energy-efficient air-conditioning concept is needed that provides for pleasant temperatures while effectively removing thermal and substance loads. These loads comprise on the one hand odorous and harmful substances that contaminate the room air. On the other hand, solar radiation, electrical equipment, lighting and not least the passengers and employees heat up the air in the building. Changing load situations and the diversity of the areas to be air-conditioned further increase the difficulty. From office to terminal, from check-in desk to lounge and to the baggage retrieval – despite different framework ­parameters an agreeable room climate with enough fresh and temperature-controlled and without draughts is required everywhere, and it also has to be as energy-efficient as possible. Added to that are statutory requirements for workplaces and areas of public assembly, where both defined comfort parameters and safety aspects are specified. All these factors have to be taken into account when designing air-conditioning systems. Complex requirements – a variety of possible solutions with high-performing and efficient air/water systems, attractive and effective air diffuser and precise components for air distribution from LTG! 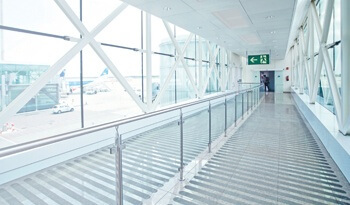 For the demanding task of air-conditioning in airports, we offer customised solutions for every function area. LTG Induction induction/chilled beam concepts, also available for all installation situations: units for ceiling installation of models HDF/HDC, sill units HFG, HFV or QHG, and floor units HFB; some of them are also available with LTG SmartFlow. All systems are of course available with a customised control concept and components. High-precision components from LTG air distribution with a complete range of round and angled pressure controllers DRE/F, flow rate controllers VRE/F/D (also with LTG ActiveControl system for high precision in a very small space) plus valves and accessories ensure an optimally matched and energy-efficient operation. For complex requirements and a high investment volume, we also recommend the expertise of our LTG engineering services. Simulations, visualisations and room flow tests in our laboratory eliminate risks from implementation and ensure selection of the optimum air-conditioning system.